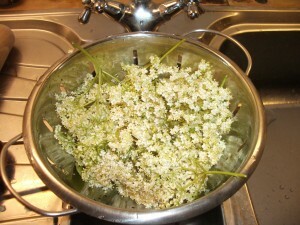 Last year I made elderflower cordial for the first time. We have around 6 elder trees in the garden, so I thought I should have a go. I looked around for recipes – there are loads on the internet and the one I decided on was on the BBC website. 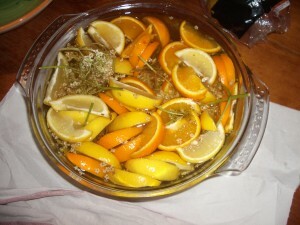 This uses 30 elderflower heads and oranges as well as lemons. 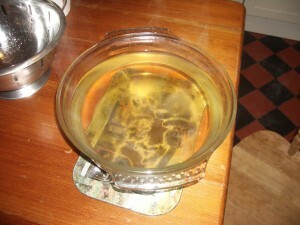 The result was amazing, and made enough cordial to last us until September. Over the last couple of days I’ve made the cordial again and I’m pleased to report the result this year is just as good. First you boil 1.7 litres of water, put it in a large bowl and add 900g caster sugar. This time I used golden caster suger which has given the syrup a slightly warmer yellow colour. I left this to cool while I went and picked the elderflowers. I washed these and then added them to the syrup. Next I added 50g of vitamin C and 3 sliced lemons and 2 sliced oranges and then left the bowl covered with a tea towel for 24 hours. Yesterday evening I removed all the fruit and flowers and bottled the cordial. This time I only used a glass bottle for the cordial I will be using fairly soon. The rest I put into plastic bottles, leaving some space at the top and froze them. Last year I made the mistake of putting full glass bottles into the freezer with messy results. Have you had a go at making elderflower cordial yet? How did it turn out? Mmmm – my recipe isn’t as nice as yours Tawney. It’s very sweet. I will be on the lookout for citrus acid early next year. (Citric acid has something to do with heroin apparently!). I might try and make a second batch if I can track down any more citrus acid. There still seem to be loads of flowers on the trees. I make my own bread and my favourite recipe calls for Vitamin C powder. I can never get any! Chemists say it can’t be sold legally and I’ve since been told that it is used in making BOMBS! Is this true? I have to resort to buying Vit C capsules and emptying the contents out. My first purchase was Vit C tablets but they were coated and I had to fiddle and pick all the coating off. Grrrrr . Why is life so complicated? Vitamin C powder in bombs? Please may I book a bottle? Alas I cannot get hold of any vitamin C powder so I am having to try a different recipe. I nearly got caught our last year, so I bought some a couple of months ago – for once I was organised!